One of my friends is the well known CEO of a giant multinational corporation. I read recently that he has a net worth of over $400 million. We've known one another since we were both teenagers and he wasn't yet famous. You would know his name, but he wouldn't want me putting this story out for the press to pick up, so I can't share it. Let's call him Fred. Very early in Fred's career, he said this to me: "Eric, for most people the basic needs are food, water, and paying the rent. For me, if I want my career to soar, the basic need is advertising and public relations. I pay for it before I pay my rent because I know it will result in the best jobs and best opportunities." It worked. Fred is famous. He's one of the super-rich, he has his own helicopter and his own jet. He has a giant apartment in New York, another in the country outside New York City and another in a billionaires' ski resort town, and probably others he hasn't told me about. Fred is one of the smartest men I know, and as I watched his career, he always made sure that his most basic need, advertising and PR, was his highest priority. In fact, at an early age he met a young PR person and cut a "lifetime deal" with her. When he couldn't afford her services, he said, "If you help me now, when I get rich I'll stick with you and be able to pay you lots of money." He stuck to his promise, and they have been side-by-side business associates for decades. He gets it. What about you? Most of the people who are rich and famous understand that the most important thing in boosting their career and staying on top is PR and advertising. Hollywood celebrities thrive on tabloid rumors because they know that if people are talking about them (good or bad), it's good for their careers. In Hollywood, the kiss of death is no press. No one ever gave me this advice, and I wish they had drummed it into my head at a young age. It took me decades to really understand it. The law of visibility is a reality for anyone who wants to be considered a celebrity in their area of expertise. Stay visible frequently. 1. Make it your mantra. Everything you do should relate to staying as visible as possible. Make it your goal to make a giant PR effort at least weekly. Chances are you can't be exposed enough to be overexposed. Look for an excuse every day, every week, to get your name in front of potential customers. Ten impressions to 10 different audiences are not 10 impressions. That's one impression to each of 10 audiences. Wherever you're focusing your attention, dominate that medium with continual visibility. Most people can't afford to dominate more than one or two things. It's incorrect to think you will achieve better response if you buy five ads one time in five different magazines. NONE of them will work for you effectively. Yet the same money spent on five ads in five issues in a row of one magazine will bring you tremendous results. If you have a limited budget, dominate something with that budget. This has to become your lifestyle. Like the film stars say, "If they're not writing about me, I'm out of business." If you want to be a giant success, you work your advertising/PR strategy every day and every week for the rest of your career. Out of sight, out of mind. Out of mind, out of business. Advertising and PR builds upon itself. Think of it as a house that is never finished. You start with the foundation, keep building until the house looks finished, and then you keep adding on. 5. Starting and stopping is like starting from scratch. I know people who advertise for a couple of issues of one of my magazines. They will buy a couple of ads, lay low for a few months, then buy some more, then lay low. Each time you lay low, you lose share of mind because you're not reinforcing your brand. Apple never stops. Ford and GM never stop. You can never stop if you want wild success. 6. Leverage your visibility strategy. Seek ways to get others promoting you while you sleep. Get others acting on your behalf. The best tool ever invented for an artist is an art gallery. If you have five or six galleries in different regions of the country, you are being promoted every day to the customers in those galleries. They are professional sales agents. One -- or six -- more galleries showing your work can do more for you than you can do on your own. 7. Participate in co-op advertising. The best deal going is when you can buy ads for your work at half the price. Many art galleries will run ads exclusively promoting your work if you're willing to pay half the cost of the ad. It's a great deal for both of you, drives customers to their gallery, and it builds your brand, which increases sales, buyer desire, and, ultimately, demand, resulting in higher prices. 8. Become a press release maven. News outlets locally, local art pubs, even national art publications are always on the hunt for a story. If your release appears on their desk on the day they need to fill a page, you might get lucky. Frequency builds your brand with editors, so any chance you have to issue a press release (on something legitimate, like an award or a new painting), send a release to everyone who reaches the audiences you want to reach. Get to know the editors, ask about upcoming stories, and make suggestions as to how you might fit. If you ever wonder why some people seem to get all the press, that's why. And if you can find someone to do press for you, especially a pro, they can pitch stories on your behalf. 9. Facebook and Twitter matter. Brands are built by frequent posts with smart information, great photos, and interesting links. Build a giant friend list and post frequently, with relevant and interesting things (we don't care about your cat's hairball or your political opinions). The psychology of advertising says that if you run bigger ads, or more ads in an issue, you are more important. That is how top blue chip art galleries built their reputations and how they keep them alive. You must be successful if you're running that much advertising. Fake it till you make it. Run ads as big as possible and as frequently as possible. But frequency is still more important than size. If you can afford only one full-page ad, I'd advise you that four quarter-page ads in four consecutive issues is better than one full-page ad in only one issue. Dominate with frequency, and then, as soon as you can, increase the ad size to grab more notice and stature in the eyes of buyers. 11. Advertising is perceived as editorial content. Research indicates that consumers prefer newspapers, magazines, and radio and TV stations that have ads to those that do not. Ads tell about things people may want or need. In art magazines like Fine Art Connoisseur, which I own, our readers love paintings, and they look at the paintings in ads as much as the pictures in the stories. Readers love seeing those pictures, and may well not remember you as an advertiser, but as an artist they now know. One of my advertisers told me she became perceived as famous because she is in every issue of the magazine, without skipping, ever. Of course, it helps her business because she never stops and her image is always being reinforced. A new art gallery once asked me if there was a way they could become as well known as a gallery that had been in business for a hundred years. Though time + consistent visibility is the strongest marketing tool, you can get very close to an equal position in the minds of audiences with a high volume of advertising, with a high volume of frequency, over a shorter period of time. I told this gallery owner that within three to five years, his gallery could be perceived as one of the biggest and most important galleries in America if he ran four to six pages in every issue for three years. Is it expensive? Yes. Is it realistic? Not for many. But this is one way to overcome the advantage of time. But Eric, How Can I Afford It? My friend Fred, whom I mentioned earlier, told me he invested in PR and advertising before he paid his rent. He knew that the investment would lead to success, and therefore he made huge sacrifices. He drove an old beat-up car, he lived in a crummy apartment and didn't go out to dinner much. He put the good things in life on hold so he could buy the visibility that would eventually result in success. Did I mention that his net worth is over $400 million? One of the great laws of the universe is that two good things may be in conflict. Truth and justice are both good things, but one may have to be chosen over the other. In art, your conflicting values may be financial success versus the respect of other artists. For instance, we all know of a famous artist who is extremely wealthy but whom most artists do not respect. He chose wealth over the respect of other artists. To accomplish frequent visibility, you may have to choose visibility over certain basic needs to roll the dice on building your career longer-term. Most successful people I know had to make those tough choices. You can always find a way if you're passionate enough to make something happen. Artists keep asking me to be their agent, but I simply don't have the time or the desire. Yet I believe that anyone with some marketing skills like those I've acquired could make an unknown artist one of the most famous and financially successful in America within three years if they had enough financial resources and drive. I do this for businesses on a regular basis with my consulting practice in marketing, but those clients typically have the resources to pay my fees and spend the money on big campaigns for long periods of time. For you, without a lot of resources, it will simply take more time. A steady drumbeat of visibility over time will eventually get you where you want to be. I guarantee I will get 50 e-mails about how "my circumstances are different" and how someone doesn't have the money to advertise. I don't doubt that. Yet you can still carve out one hour daily to create visibility without spending a dime. Some who see a clear vision will find the money from friends, family, and personal sacrifices. You just have to want success badly enough. Following this program is not for wimps. It's for people committed to becoming a major household name among collectors. Nothing good is ever accomplished without risk. Your success is 100 percent determination to succeed at chasing your dreams. Go knock 'em dead. You can make great things happen. One of the most powerful ways to grow your brand and your business as an artist is to find others to sell for you while you concentrate on painting. This is what galleries do so well. Whether you want your first gallery or you want to add more galleries so you can increase the number of artworks you are selling, I can help. My company has a magazine called Artist Advocate whose sole purpose is to expose your artwork to galleries. We all know galleries are busy and don't want to be bothered with artist solicitations. One gallery in New York said to me recently, "Eric, every artist who calls, we tell them we no longer accept solicitations. If you're not in Artist Advocate, we will never see your work. We recommend it." They went on to tell me how it is a wonderful tool to allow them to look for artists, and that they keep it as a reference and watch artists from issue to issue to see if they are consistent. If you want to see your artwork showcased to 15,000-plus galleries (6,500 by mail and the rest by e-mail), Artist Advocate can help you find a gallery so you can sell more and concentrate on creating art. Get in touch with the individual below for information, or e-mail me back and say, "Eric, have someone contact me." The Fastest Painting Sale In History? My friends will tell you I'm a fairly modest guy. I've learned to overcome my shy nature because, to succeed in business, you have to learn to blow your own horn once in a while. It's the hardest thing I've ever learned, and I know it's tough for most artists as well. So here I go, blowing my own horn. I was flattered when Jim and Mark at Greenhouse Gallery asked me to conduct an art marketing workshop at their gallery the day after their Salon International dinner. I drove home to Austin on Friday night and had to return to San Antonio for the 2 p.m. seminar on Saturday. I was making last-minute changes to the presentation when the phone rang. It was my artist buddy Anne Nelson Sweat, who was planning to accompany me on the 80-minute drive. "If we're going to be on time, you need to be here to pick me up in 15 minutes, " she said. I was still in jeans and sneakers. I spent another 20 minutes preparing the notes and rushed out the door to pick up Anne. I suddenly realized I hadn't had a bite to eat all day, but traffic was bad and there wasn't even time for fast food. I was probably well over the speed limit when Anne, who was looking on the GPS navigator on her iPhone, shouted, "Quick! Turn here!" I swerved from the middle lane and exited just as she announced, "Oops, wrong exit." Just as I was about to get back on the highway, I noticed traffic had stopped. I made a quick right and asked Anne to navigate us on back roads to avoid the traffic. Countdown: 10 minutes. We were at least 15 minutes away according to the GPS, and if we hadn't taken that turn we would have been an hour late. With one of the gallery staff talking us through the back streets we, walked in exactly at 2 o'clock. I never did eat. I walked in the door with my shirt tail hanging out from my jeans. Frankly, I was comfortable, it was Saturday, and why not? Yes, I had butterflies as I saw the 50 artists in the room waiting for me to say something meaningful. Though I've conducted hundreds of speeches and seminars, it never goes without some angst -- and this was more than usual because my notes were still in disarray. At the end of the second hour, the artists asked me if I would keep going, so I did until Mark from Greenhouse pointed to his watch. The opening was about to begin. The seminar went three hours, and not one person got up the entire time. They seemed to be engaged. As I said, blowing my own horn is hard, but I felt like a proud papa. During my seminar, I taught a system for using stories to sell art. It's much too complex and time-consuming to get into here and now, but about an hour later, during the opening of the exhibit, one of the artists approached me and said, "I followed your advice. A man was looking at my painting, so I walked up and told him my story using the techniques you outlined, and he instantly bought it." I remember the artist's face but I don’t know her name. So if you're reading this, call me! The following week, I received an e-mail from another artist who had a similar experience and sold his painting the same way. Artists tell me that people need to interpret a painting to their own meaning. I agree to an extent, but, because artists are creative types, they assume everyone can do this. Some people have little imagination, and if you can help them along with a well-crafted story (don't lie) that isn’t boring, is fact-based but not fact-filled, and is written to help people see themselves in the painting, you will sell more artwork. So will your gallery. Are you using stories to sell art? During the seminar I was asked if I'd be willing to do a two-day version. The answer is that nothing is planned, but if I get enough e-mails from people willing to come to Austin for a paid seminar, I'll consider doing it. My e-mail is [email protected]com. Please don't hit reply, and PLEASE put ART SEMINAR in the subject line. If at least 50 people who interested, I'll put together a class and let you know the fee once I determine the cost to rent a venue for two days. Marketing art is detailed and complicated for a lot of artists, but I think I can make it easy for you. 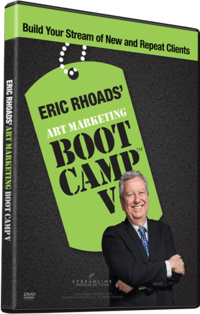 The most asked question at the art-marketing seminar was: How do I get into an art gallery? I have a magazine called Artist Advocate that is mailed to 6,500 galleries that sell ORIGINAL art. We e-mail it to another 8,500 people. You can have your own page showing your artwork for all these galleries to see. Dozens and dozens of artists have signed on with new galleries as a result, and now that the economy is starting to improve and more galleries are looking to get more active, this is the perfect time to begin the process of exposing your art. For information about the publication, go to www.artistadvocatemagazine.com, or call one of the people listed below.